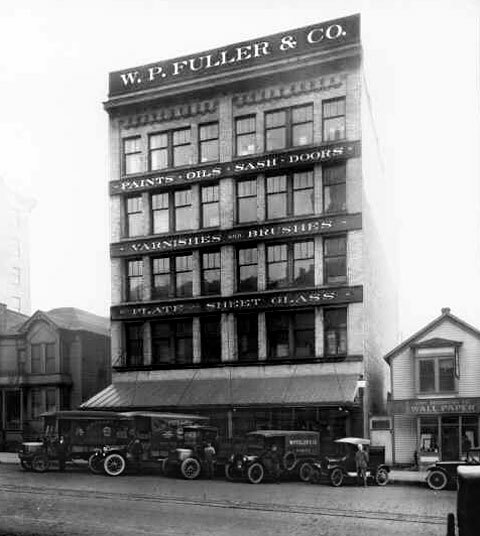 Fuller Paint company distributed mirrors, paints, oils, window glass, brushes, varnishes, turpentine, glue, gold leaf, artists’ materials, throughout the western United States, and were pioneers in their product formulations and business efficacy. William Worthington, Sr. was in business with W.P. Fuller, who later established the Fuller Paint Company. A huge merger in 1868 made Whittier, Fuller & Co. the company the largest one dealing in paints, oils and glass on the Pacific coast. A son, William P. Fuller, II (1861-1936) became the president of the new firm. He retired in 1905.